WANT PRACTICAL SOLUTIONS AND ADVICE TO HELP BUILD YOUR ONLINE BUSINESS? Through building and managing multiple multi-million dollar businesses, I’ve seen countless well intentioned business owners and eager newcomers dive headlong into trying to learn how to build a business online. And without being harsh, the vast majority of them fail. Some just outright quit after a few months, while others bounce from one bad idea or internet marketing gimmick to the next making zero progress. For most people it takes years of trial and effort to learn how to successfully setup and run a business online. And while you’re busy trying to figure it out, the world keeps on moving forward. Innovations occur and you fall further behind. Eventually most people just give up. This past year I watched one particular person struggle immensely. She constantly switched between riding the “guru merry-go-round” and spending so much time on Facebook that it was like she had a team of people posting on her account. Product creation, starting new services businesses, podcasts, YouTube videos and just about every other thing you could think, she tried them this year. It was like an explosion of internet marketing craziness. I offered advice and really tried to help her. In the end, this person just kept bouncing around from one poorly thought out failure to the next. I really couldn’t stand to watch it anymore. I’ve seen so many people go down this road, I’d almost become numb, but this one really stood out. I’m a realist, I know I can’t help everyone, there are those people who simply refuse to be helped. But I also know that there are people out there searching desperately for someone to help them. They want to work with someone who isn’t trying to take advantage of them or sell them the latest bright, shiny object for a $10 affiliate commission. That’s right, I’ve created a physical newsletter – ink on paper – that gets mailed to your door every single month. Each issue is between eight and twelve pages in length and contains some of best knowledge I’ve collected over the last nearly ten years of online marketing and twenty years of business experience. The newsletter is meant to be consumed and acted upon. The idea being that you sit down, read it, take notes and start implementing things right away. Some issues will be more strategically focused, others will be tactical in nature, but every issue is designed to help you solve actual problems in your online business and teach you something important to your success. While I was pulling together the idea for this newsletter, I started thinking about setting out some “rules of racing” for subscribers to help you avoid the big mistakes I’ve seen people make. See, the “information superhighway” is littered with potholes and speedbumps. There are bandits lying in wait on the side of the road trying to sell you snake oil and steal your money. It’s a bumpy journey for sure, but I knew I could pull something together that would be like warning signs to get you to your destination quicker and more safely. When you sign up for the newsletter, you get a FREE copy of my book shipped to your door to help you get you on the right path. This book is a collection of my guiding principles for success online. It’s the framework with which I run my own online businesses and in some respects, how I live my life. 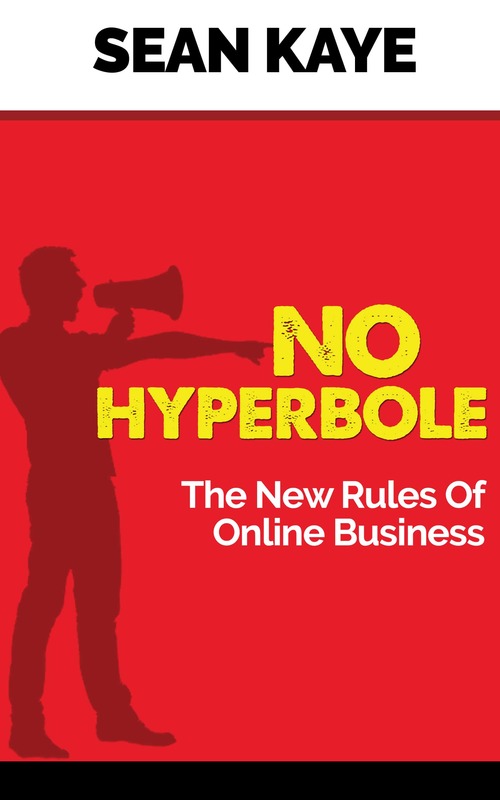 As is my way, much of what you’ll learn in this book is the opposite in many respects of what “gurus” and self-annointed “experts” will tell you – that’s why it’s called No Hyperbole, there’s no BS. Why striving to be an expert is entirely overrated and ultimately not worth the time or the effort (I show you what you should be aiming to achieve). The invaluable marketing lesson I learned from being diagnosed with severe Sleep Apnea (Find out how I turned this into an autopilot traffic source). Discover the life changing business lessons I learned from Homer Simpson (It’s amazing how TV’s dumbest character can be the source of so much marketing gold). The mathematical principle behind making higher profits with less effort (It also focuses on fewer customers giving you back the one thing you can’t buy, time!). Understand similarities between cults and exceptional marketing (People will actually thank you for showing them the right way to think). The second most powerful force in the Universe (Harnessing this force will grow your business faster than anything else while generating happier customers). Why being technical can actually damage your chances of success in online business (I suffer from this and tell you what I do to overcome this problem). The reason why customers are almost always willing to pay more (Building this into your business from day one dramatically increases your chances of success). This book will help set you on the right path to success and give you the ongoing guidance to stay there! Aside from the book, I’m going to help you maximize your chances of success with some additional bonuses only available to people who subscribe to the Casual Marketer Monthly Newsletter. My personal email address where you can ask me questions or for simple advice – this is a great way to get unstuck and I have enough experience to give you a different perspective on issues. Free educational materials that will only ever be released to my subscribers – short reports, product reviews, interviews and presentations that usually end up in my “vault” will be exclusively shared with you. Discounted access to my private, one-on-one mentoring and coaching programs – get on the phone with me a couple times per month for an hour to get help with your business. Preferential referrals of clients and leads that come to me – I am often asked by colleagues if I know people who can help clients solve particular problems and my Casual Marketer subscribers get first crack. Like most things in life, this newsletter isn’t for everyone. When I first started floating the idea in a few communities I’m in, some people balked at the fact that it was actually a physical newsletter and wanted digital versions. Unfortunately, this newsletter isn’t for them. I believe that having the envelope turn up at your door every month will ensure that you consume the content and make the most of it. This newsletter is for action takers – I don’t want product hoarders buying this, downloading it and never looking at it. There are tons of other options for you, go buy those if that’s your thing. But if you’re serious and you want to learn how to build your business, on your terms, then for just over US$1 per day you can click the buy now button below and take a shot. There are no refunds, but you can cancel at any time. The newsletter will ship during the middle of every month and when you subscribe, you’ll receive your first issue during the next scheduled monthly mailout. Join the Casual Marketer Monthly Newsletter now and lock in your price for as long as you maintain your subscription.